Valin offers electric tank heating solutions for any application and any style of tank. 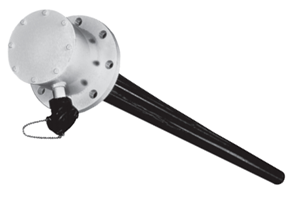 Large tank heaters are available that are uniquely designed to heat large storage tanks located above or below ground that contain highly viscous fluids or heat sensitive materials. These units allow tank heating elements to be changed without draining the tank. This is ideal for large capacity tanks that must remain filled for continuous operation and storage. Low watt density heating over a large surface area, while providing precise temperature control for such materials as fire water storage, asphalt, diesel, lube oils, ethanol, bio-diesel, glycerin, animal fats, vegetable oils, fuel oils, or similar types of liquids. No Tank Draining Required - Open-coil (OCE) style heating elements can be inspected or changed without draining the tank. This reduces costs and production downtime. Quick & Easy Installation - Standard ANSI flange provides a straightforward mating connection and requires no special modifications. Third Party Certifications - Moisture Resistant Housings are CSA Certified. Explosion / Moisture Resistant Housings carry both CSA and ATEX approvals for hazardous locations. Minimal Spacing Required - Open-coil (OCE) style elements can be bent to a vertical plane during removal, with as little as 36" of clearance between tanks, walls or other obstructions. This allows more efficient use of factory floor space. Clean, Pollution Free Electric Heat - No open flames, no additional plumbing connection, quiet operation, and better operating efficiencies. In addition, electric heat can be precisely controlled with control panels. Overtemperature Sensor - Units available with a type J thermocouple for overtemperature sensing on the pipe wall.